Autumn is upon us, which means that beloved birds are once again on the move. Millions of birds are flying south to their winter habitats. Every migrant responds to its own timetable and follows its own route. To spy smaller birds like warblers and waders, simply keep your eyes open as they filter stealthily through your territory. To see raptors on the wing, however, your best bet is to find a strategic vantage from which to observe their migration. 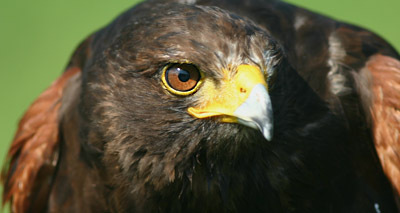 Hawks, harriers, falcons, eagles, and vultures are diurnal migrants. Many of these raptor species, such as Broad-winged Hawks in North America, are gregarious, which accounts for impressively large flocks or kettles of impressively large birds. Raptors prefer to migrate over land rather than water so they often stick to mountain ranges and river valleys. As these birds all tend to traverse the same trusted routes, known as flyways, some watchers are fortunate enough to spot thousands of them during a single day’s hawkwatch. Sweet! Even if you don’t live close to a world-class hawkwatch site, you should still try to make this seasonal spectacle part of your annual fall calendar. On a good day, the peregrination of predatory birds offers as awesome a display of nature’s grandeur as you’ll find. Raptors are on the move right now and will be for many weeks, but each species responds to specific environmental cues to begin migration and may take flight ahead of schedule. Some birds are early migrants while others take their time repairing to their wintering grounds. Find out when your target species soar through your neck of the woods and hie to high ground. Then, be sure to make yourself comfortable… hawkwatching may possibly be the most relaxed form of birding around. Don’t skimp on the gear. Bring a field guide, a chair, food, layered clothing, and your best optics. In this enterprise, spotting scopes can be quite useful. Consider recruiting a raptor expert as well; identification of birds of prey racing swiftly overhead can be tough even for the pros! Also be advised that while you’re watching for raptors, you’ll undoubtedly spot plenty of other birds as well. Sounds like the perfect pastime for a crisp autumn day, doesn’t it? Happy Hawkwatch! You’ve got me fired up! I’ve only spent one day hawk watching.It was late in the season and at an out of the way site that wasn’t know for seeing that many hawks. -I learned quite a bit in that one day from the hawk watcher who was assigned to that sight.-This year, I’m trying a local spot, a hot spot, and a spot used by my local audubon club.-Looking forward to it!